The recent of End-of-Sale and End-of-Life Announcement for the Cisco Secure Access Control System has left no option but to migrate towards Cisco Identity Services Engine (ISE) product line. Cisco has successfully implemented the Cisco Secure Access Control System (ACS) product functionality into the Cisco Identity Services Engine (ISE) product line. Cisco Identity Services Engine (ISE). 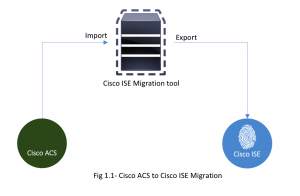 The migration tool uses the Cisco Secure ACS Programmatic Interface (PI) and the Cisco ISE representational state transfer (REST) application programming interfaces (APIs). The Cisco Secure ACS PI and the Cisco ISE REST APIs allow the Cisco Secure ACS and Cisco ISE applications to run on supported hardware platforms or VMware servers. One cannot directly run the migration tool on a Cisco Secure ACS appliance. The Cisco Secure ACS PI reads and returns the configuration data in a normalized form. The Cisco ISE REST APIs perform validation and normalize the exported Cisco Secure ACS data to persist it in a form usable by Cisco ISE software. Cisco is offering up to 63% off on Cisco ISE hardware and software license bundles for those who want to migrate from Cisco ACS to Cisco ISE. However the customer with both ACS and ISE installations are not eligible for the migration bundles. The below table shows the major milestones for the latest announcement. It’s a good approach from Cisco to push the flavor of Cisco Identity Services Engine (ISE) product towards their customer.